Zone 4. Hardy native. Relative of Cardinal Flower. These perform best in a moist organic soil. Frequent division will increase vigor and longevity. This is a very showy native prairie species. It is only remotely related to the annual trailing lobelia which is much better known. It is more closely related to Cardinal Flower (Lobelia cardinalis). The late summer flowering period makes it a useful addition to the mixed border. It will also naturalize well in the right conditions. The plant forms a compact rosette with flower stalks reaching a height of 2 to 3 feet. 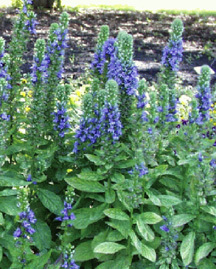 The spiked flowers are a beautiful shade of medium blue and make a nice addition to bouquets. I also have a white form. Lobelia will tolerate a partially shady spot. If grown in full sun, care should be taken to make sure that the soil does not become too dry. Division is generally not necessary but can be used as a means of increase. Lobelia will also self sow if moisture is sufficient. Strongly recommended for those interested in Minnesota native species.